I saw this movie when I was about 7 or 8 years old in West Vancouver, BC. It was the first train movie I ever saw on the big screen. I still remember Edgar Buchanan (Uncle Joe from Petticoat Junction) breaking up a kiss between Molly Bee and Ben Cooper. Edgar Buchanan had sneaked up on them on a railroad handcar and told them he had orders “to pick up all cars with D&M markings”. I later found out D&M stood for “Detroit & Mackinac Railway”, but that’s not the railroad line in this movie. It was actually filmed in Oregon on an SP branch. It turns out, the movie is just about impossible to find for reasons described below. I’ve never seen it offered anywhere on VHS or DVD even on the really obscure movie websites. About all that’s left to purchase of this movie are the one-sheets and lobby cards remaining from the film. I would REALLY like to see this movie again, even though it’s supposed to be pretty corny. 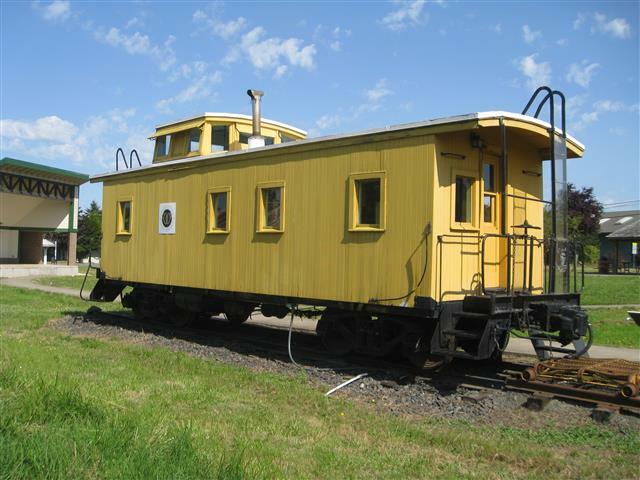 On my way to the 2012 GNRHS Convention in Klamath Falls, I photographed the former SP #159 caboose in Lowell, Oregon. 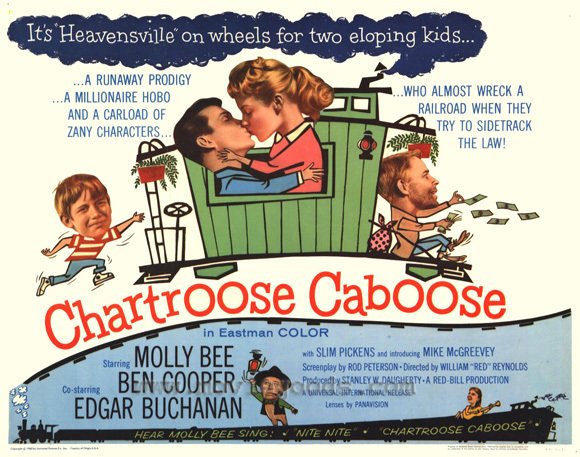 This is one of the cabooses that appeared in the Chartroose Caboose movie. 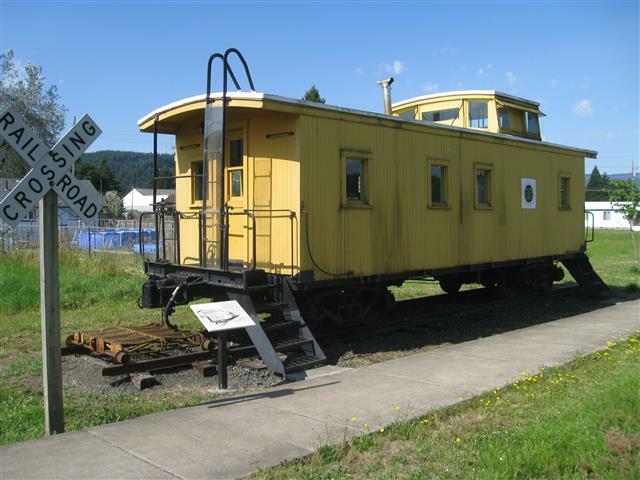 Shortly after the movie was filmed, this caboose went to Weyerhaeuser, who eventually donated it to the town of Lowell. The following text was taken from the http://www.pnwc-nrhs.org/ website — which doesn’t seem to have it online anymore! So, with credit to them, I present the most information I have found to date on Chartroose Caboose. 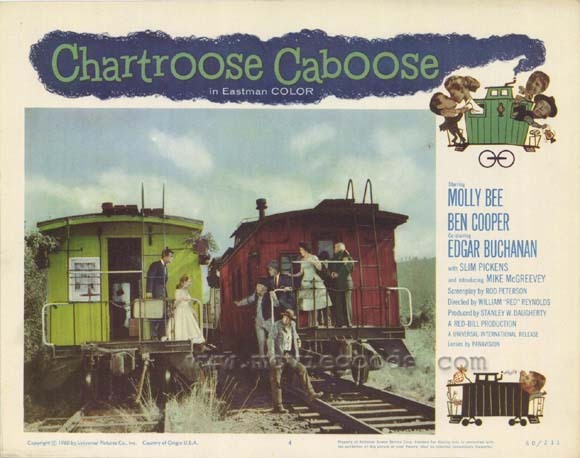 Thank you for the information on Universal’s 1960 feature “Chartroose Caboose”, for which details until now have been almost impossible to locate. Glenn Laubaugh, Web Site Editor, Pacific Northwest Chapter of the N.R.H.S., Don Henderer, retired from the S.P., and John Beardsley, also retired from the same rail line, provided exceptionally accurate details on locales, filming, dates, and background information into long-forgotten technical aspects of the movie, and I will be forever indebted to them. Mr. Laubaugh’s mapping on the World Wide Web proved to get the entire project rolling, so to speak, as his detailed graphics and spectacular ageless data are without equal. Don and John, who provided corroborating material about the 1959 filming helped me find out details on the film whose master prints were destroyed in a water pipe break in one of Universal Studio’s negative vaults back in the 80’s. I have one of the last existing copies of the film having rented it for home use back in the late 70s… fortunately making a digital video tape transfer of it. Glenn, Don and John’s accurate information and geography are exceeded only by their warmth and generosity! Let me introduce myself. I was a Brakeman Conductor for the SP for 39 years, and have been retired for 18 years. Well I have been looking for the movie for years and knew it was on VCR as Oregon Broadcasting Company Portland Or. had showed it years ago, but they no longer had it. But to my surprise I saw the letter that Dale Mikolaczyk had wrote in the mailbag and your note in The Trainmaster. So Toot Toot Cupola Don. I see that you are requesting any information regarding the film “The Chartreuse Caboose”. I was a brakeman on the Southern Pacific Railroad during that filming. I am now retired. I was working on a local in the vicinity of Springfield station of the S.P. at that time. The Springfield yard consisted of three tracks about fifty cars long with a lot of industrial spur tracks along with them. The film was produced by a person named Red Reynolds. He since has passed away. He was either from Hollywood or went there after producing the film. At the far east end of the Springfield tracks was a track that went to Marcola which was known as the Marcola branch. It was on this railroad that this was mostly filmed. I was on a switching run that was over this piece of railroad. We couldn’t use it while they were using it for their filming which amounted to about two or three hours. In the write-up in the Trainmaster they were in error in stating that they thought it was filmed on the Springfield-Lebanon branch. It was the Springfield – Marcola branch. Part of the film could have used the Eugene yard of the S.P. The engine used for the film was one of the lightest engines the S.P. owned, partially because part of the tracks used was limited to the tonnage of the track limits. Also, the S.P. let them repaint the caboose for the filming. The track had a covered bridge on this branch line that was one of the restrictions for the use of the small engine. It was a big part of the filming. In the film, there was an episode where the caboose was to enter a spur track that was just before this bridge. It was a spur track for a mill located there. The engineer was Del Hebert, who has since passed on. A brakeman named Les Hinshaw rode the caboose in this move. Les Hinshaw has also passed on since this film was made. They had to make a movement called a “drop” or “flying switch”, which required a move where the engine and caboose got up enough speed to let the brakeman uncouple from the engine, and the engine went away from the caboose to let another person throw the switch and let the caboose enter the spur track and brake, by hand, to stop it from going over the end of the track. It was interesting to watch the move. My wife and I saw the movie after it was produced, at the only movie theatre in Springfield. Hope this information is of interest to you. This entry was posted in Uncategorized and tagged Ben Cooper, Chartroose Caboose, Edgar Buchanan, Lost Movies, Molly Bee, Slim Pickens, Southern Pacific Railroad. Bookmark the permalink. I saw this movie after school one day in the 60’s on the afternoon movie series “Dialing for Dollars Early Show” and loved it. I watched the station every day at 3:00 and wish there was less cable as kids would be better rounded. From “A Patch of Blue” to “Incredible Shrinking Man” to “Chartreuse Caboose” etc I got a well rounded education in film and life. it was such a happy movie that since that day i have said I would like to live in a caboose and have checked out several hotels and restaurants with such!! I did not remember the music but it was heartwarming “corny” which I think we could all use a bit more of today.